Miro Consulting’s IBM audit defense is comprised of analysts with decades worth of software vendor audit experience. IBM is one of the top three auditors and is the #1 software auditor, according to Gartner. Typically, a formal software audit letter from IBM will arrive demanding information. Miro Consulting’s IBM audit defense is comprised of analysts with decades worth of software vendor audit experience. Our analyst’s work with our clients as trusted advisors throughout the audit defense process and, in many cases, sit beside our clients during the vendor audit and contract negotiation period. Our IBM analysts are laser-focused on the changes and nuances of IBM licensing. IBM audits can take as long as 12 to 18 months. Annual maintenance payments are not proof of entitlement. IBM license metrics aren’t simple. There are at least nine different methods of IBM licensing metrics. Sub-Capacity licensing is ideal for virtualized and partitioned environments. IBM’s Passport Advantage may not include 3rd party purchases, legacy software or active software with no maintenance. 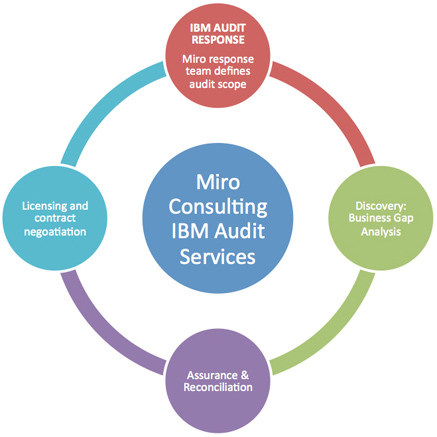 Miro Consulting’s IBM audit services provides strategic counsel and experienced analysts that work alongside the IT organization to ensure and assure licensing compliance.